Take advantage of a two-day tour to discover the finest Châteaux of the Loire Valley, of major importance in the history of France, and visit private homes and royal residences of the Renaissance, revealing the gentle pleasures of life. Your first day will be devoted to the Château d'Amboise, the Château du Clos-Lucé, the gardens of Villandry and the city of Tours. The second day of the tour will be dedicated to visits of the castles of Chenonceau, Cheverny and Chambord. You will leave our agency, located near the Louvre, at 7:15 am, on an air-conditioned coach accompanied by our qualified guide-interpreter. After crossing through the southern neighborhoods of Paris, you will take the Aquitaine motorway for an approximately 2 1/2 hour ride until you reach Amboise. Take a guided tour of the Château d'Amboise, a UNESCO world heritage site. Discover the daily, private life of sovereigns and go behind the scenes of the Court. You will have free time to admire the castle's superb gardens, which offer a remarkable panoramic view of the Loire Valley. You can also take advantage of this time to eat lunch, either in the gardens or in one of the snack bars located near the castle. When you are done, meet up with your guide to head to the Château du Clos-Lucé, just a 10-minute walk from the Château d'Amboise. Discover the residence of Leonardo da Vinci thanks to a guided tour that will immerse you in the private life of this Renaissance genius. He was invited to Clos Lucé by François I and lived there for the last three years of his life. You will then have a 45-minute drive to the Château de Villandry. In the company of your guide, discover the magnificent avenues of linden trees dividing the gardens into several different levels and plantations. You will be captivated by the various colors of the gardens of Villandry with their peaceful atmosphere.Next, you will continue to Tours (30 minutes from Villandry by coach). The day will end at a hotel in Tours (Hôtel Mercure Tours Nord or similar) for a dinner with the group and overnight accommodation. The next stop is Cheverny, approximately 45 minutes from the Château de Chenonceau. Your guide will take you on a tour of the Château de Cheverny, a 17th century seigneurial property, with its apartments conveying the French art de vivre with rooms such as the birth chamber and the private dining room. Once you have visited these admirably decorated interiors, you can enjoy an overview of the Château's superb park before eating lunch at the Saint Hubert restaurant in Cour-Cheverny. After lunch, you will head to the Château de Chambord, some twenty kilometers from Cheverny. This large Loire Valley château will unveil its fascinating, complex heritage built by François I in the 16th century. Behold its extraordinary architecture with the famous double-helix staircase in the center of the monument, and visit the former lodgings of the king and the château's other rooms on its various stories. The large terrace with its majestic chimneys offers a unique panoramic view of Chambord park. You will leave Chambord at around 4:30 pm, reaching our agency in Paris at around 7 pm. On the occasion of the anniversary of the death of the Italian genius Leonardo da Vinci, many events are organized. You may have the chance to attend! For the first time, you can discover the famous tapestry of "The Last Supper" at Clos Lucé castle from June 7th to September 2nd. This 9,15 meters long and 4,90 meters high work, commissioned by King François 1 and his mother, represents the biblical scene of the last meal of the Christ and is inspired by the fresco painted by Leonard de Vinci for the Santa Maria delle Grazie convent's refectory in Milano. It's usually exhibited at the Vatican pinacoteca . On September 27th, the Spanish musician Jordi Savall will orchestrate an exclusive concert given at the Clos Lucé castle, inspired by the master Leonard da Vinci and by the Renaissance period. Come assist to this exceptional show! From April 13th to April 23rd, many activities will be organized to immerse yourself in Leonardo da Vinci world. You will be able to participate in family to the different workshops, and to enjoy many surprises. The exhibition "Leonard de Vinci's death - the construction of a myth", in connection with the French National Library which takes place from May 2nd to September 2nd, traces the special link between the italian artist and the King François I. You will be able to see the famous painting by François-Guillaume Ménageot and many engravings and reproductions realized by the italian graff artist Andrea Mattoni AKA Ravo. 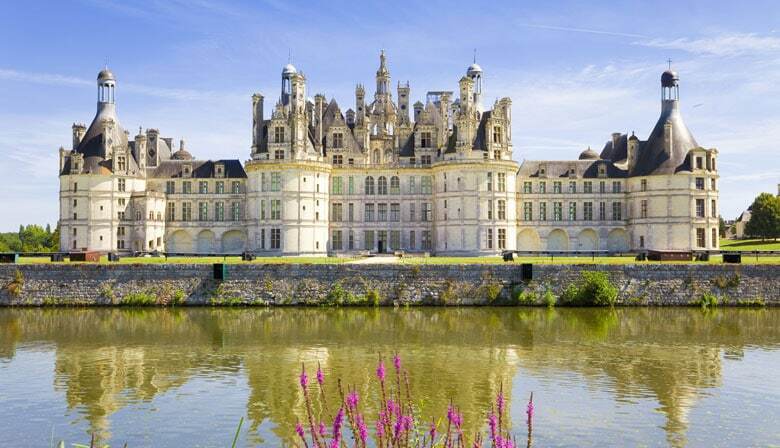 The famous Chambord castle, known for its unique and fascinating architecture, celebrates its 500 years. It's the perfect opportunity to delve into the past to understand the architectural project of King François I and Leonardo da Vinci through the 150 exceptional works presented. You will also be able to admire some projets realized by the best architecture universities in the World, trying to reimagine Chambord in the future. Digital exhibition, kid-friendly exhibition, from May 26th to September 1st. Lunch in Amboise: you can eat lunch on the lawn in the park's gardens provided that you do not litter. The duration and times may vary depending on the course of the excursion. In the case of a booking requiring a single room, a supplement of 20€ will have to be paid at PARISCityVISION agency prior your tour departure. - For a booking of 3 people: you will be in a double room and a single room. In that case, you will have to pay the 20€ extra upon the departure. Triple rooms are unavailable. See comments above as a rating for the 2 day tour. I truly enjoyed every minute of it,it was like a dream!! !Florance was absolutely super!Thank you! When you have children in the group, it would be good to have an option in the dinner and lunch menu for them. The food offered was good but for adults. Very good guides. Good organisation. Some castles need more time for the visit but not possible. Villandry, Chanonceau and the town of Tours. Guides and program were awesome. The only thing is that I am a picky eater, so the fixed menu meals were not good for me. Otherwise, a wonderful experience and very nice accomodations.